Let's start things off by going through some IDP news, notes, and commentary from Week 3 of the NFL season. Broncos MLB Joe Mays has been suspended one game for his helmet-to-helmet hit on Matt Schaub in Week 3. Cowboys SS Barry Church is done for the season with a torn right Achilles' tendon. Darrelle Revis will miss the remainder of the season with a torn ACL. 2nd year player Kyle Wilson will slide into an every down starting role. Patrick Willis has been diagnosed with a sprained ankle, but the 49ers do not "consider the injury to be serious." Owners of Willis in SUPER deep leagues, may find it prudent to go pick up Larry Grant as insurance just in case Willis is unable to go this week. The Raiders have temporarily moved Michael Huff to left cornerback. Antoine Bethea put up a big fat goose egg against the Jaguars in Week 3. Owners shouldn't worry about this poor performance too much. The Jaguars only threw the ball 21 times. Lawrence Timmons had yet another very disappointing performance. I'm cutting bait with him. I'd rather own Larry Foote at this point. Justin Tuck failed to remained sack-less last week. He's looked sluggish and complacent so far this season and I wouldn't feel comfortable rostering him as anything other than a DL3 at this point. 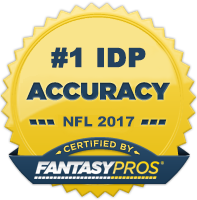 Now onto The Guru's IDP waiver wire selections for Week 4! LDE Carlos Dunlap (CIN) - Dunlap was a hot preseason sleeper; however, he was dropped in a lot of leagues as he missed the first two regular seasons games with a knee injury. In his first regular season action last week, he posted 2 TFLs, a sack, 1 FF, and a 1 FR. This kid is ultra talented and has the potential to be one of the league's more dynamic pass rushers. The Bengals are thinner this year at the DE position and are therefore more likely to use Dunlap on more of an every down basis which should help his tackle production. If he's out there in moderate to deep leagues, grab him. He's a DL3- with an outside chance of DL1 upside. LDE Michael Bennett (TB) - I targeted Bennett as a late round value in several of my fantasy drafts this season. He had two sacks against Dallas last week (3 on the season) and with Adrian Clayborn done for the year, he will be counted upon to step up his game even more. He's a solid run defender and should give owners steady production in that department. I woudn't count on double digit sack totals, but 7-9 over the course of the season is reasonable. RDE Michael Johnson (CIN) - Johnson had a breakout game last week with 3 sacks on RGIII. He will likely be the top DL waiver wire selection this week in most leagues. I think he's deserving of a low-end DL3 spot on most teams, but I would rather own Dunlap. With this said, I would prioritize Dunlap and go for Johnson as a backup selection. DT Tyson Alualu (JAX) - This recommendation is more for those in deep, DT-required leagues looking for a short-term pickup. Alualu has a great matchup this week against the Bengals who have allowed 12 sacks so far on the season. His week 5 matchup against the Bears shotty line is also quite delectable. SLB Akeem Ayers (TEN) - Ayers has been on an absolute tear so far this season. Over the course of the season's first three games, he's posted 24 solo tackles, 12 assists, 1 sack, and 2 PDs. Although Ayers has played better in his 2nd season, his rapid increase in production is more so due to the fact that up-and-coming stud Colin McCarthy has been out with ankle injury and the Titans defense has received a ton of tackle opportunity so far (Ayers is third amongst all linebackers in snaps played at 237). With all this said, I expect there to be significant reductions to his stat lines once McCarthy returns to full health. In the mean time, continue to start Ayers. He's a top 10 linebacker this week against the Houston Texans. SLB Russell Allen (JAX) - Allen is in a very similar situation to Ayers. Over the last two games, he's gone 12-1 and 9-2 with a PD in each game. With Daryl Smith out, Allen has assumed every down linebaker duties. This, combined with a healthy amount of tackle opportunity, has led to a (likely temporary) balooning of his numbers. Smith has already been ruled out for Week 4 and the matchup against Cincinnati is a juicy one for linebackers. Continue to ride the hot hand of Allen as a LB3+. SLB Phillip Wheeler (OAK) - Wheeler has been solid for us so far this season. He has 26 total tackles 2 FFs, 1 FR, and 0.5 sack. With Rolando McClain undperforming as usual, more scraps have fallen to the five year veteran Wheeler. He's an every down linebacker on a team with a below average amount of tackle competition. He should continue to be a high floor, LB3- matchup play for owners looking to cover off on bye weeks/injuries. MLB Rey Maualuga (CIN) - I will be the first to admit that I am not a Mauluga fan. He lacks that certain instinct most standout NFL linebackers seem to possess and that hesitancy has shown up in the box scores. However, the season-ending injury to WLB Thomas Howard has left Rey Rey with little to no competition for tackles. The matchup isn't ideal this week but he's worth a roster spot as a low-end LB3 in 12 team leagues, especially those that reward for assists. CB Josh Norman (CAR) - I called out Norman in last week's waiver wire article as a guy to keep a very close eye on. He was harassed by the Giants last week and consequently put up 11 tackles (8 solo). He goes against Matt Ryan and the Falcons vaunted passing attack this week and should see plenty of action again. CB1 potential this week and CB2+ with upside the rest of season if he keeps the job. SS Atari Bigby (SD) - The strong safety position in San Diego has produced several viable fantasy players over the last couple of years. With Eric Weddle roaming the deep zones of the defense, Bigby has been spending a lot of his time near the line of scrimmage. He probably won't put up many big plays in this position, but he should be a good resource for a steady amount of tackles week in and week out. DB3 in tackle heavy leagues. SS Jordan Babineaux (TEN) - I feel like this is about the 10th time Babineaux has made an appearance in one of my articles. I hyped him up all off-season as this year's breakout fantasy DB. Then I quickly put the brakes on that recommendation once Head Coach Mike Munchak revealed he was going to play his safeties in a rotation. "Babs" didn't see much playing time at all over the course of the Titans first two games. However, he gained his starting position back last week and posted a respectable 5 tackles. There's no guarantee he keeps playing every down, or starting for that matter, however he's definitely worth a waiver claim in deeper leagues. Stash him on your bench and wait to see how the situation plays out. FS John Wendling (DET) - Wendling is a short-term, one week pickup as he's just filling in for the injured Louis Delmas and the Lions go on bye next week. He's the type of guy I love to use as a desperation filler type play. He seeks contact, however is horrible in coverage and teams know it and exploit it. This leads to good fantasy numbers. He's had 13 solo tackles over his last two games and projects to have 5-7 solos this week against the Vikings.